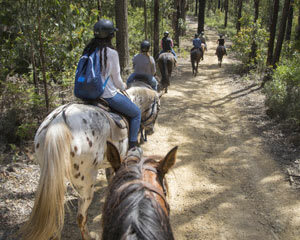 Join us on a 2 hour horse trail ride through the Yarra Valley’s Toolangi State Forest. Ride through some great country, with views across the Yarra Valley. 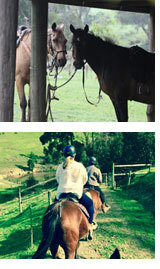 Join us on a 2 hour horse trail ride through the Yarra Valley’s Toolangi State Forest. Only 1 hour from Melbourne’s CBD, come and ride through some great country with views across the Yarra Valley and across the Great Dividing Range. Ride through some great country, with views across the Yarra Valley and across the Great Dividing Range. You'll ride through great forest tracks on a purpose built Horse Riding Property of over 130 acres bordering the expansive Toolangi State Forest. Riders on the 2 hour Toolangi State Forest ride often see a range of wild animals including; eagles, kangaroos, wild deer, rabbits and wombats. You're in safe hands: The operator of Chum Creek Horse Trail Rides is one of Australia’s most experienced Horse Trail Riding Guides, having personally taken out over 6,000 riders on Horse Trail Rides in the Australian Bush and Victorian High Country. Trail Rides go out in all weather conditions. Chum Creek Horse Riding & Huts reserves the right to cancel rides due to adverse weather and environmental conditions.